Nina Simone (piano, vocals), Jimmy Bond (bass), Al Heath (drums). Heavyweight tip-on gatefold jacket from Stoughton Printing ! Plated and pressed by Quality Record Pressings ! Now At 45 RPM ! For more information on Little Girl Blue and the life and times of Nina Simone, see Princess Noire : The Tumultuous Reign of Nina Simone by Nadine Cohodas, The University of North Carolina Press, 2010. 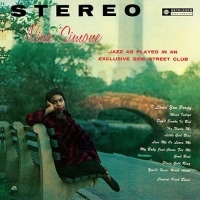 Little Girl Blue was Nina Simone's debut release. Bethlehem founder Gus Wildi, taken with the uniquely beautiful quality of her voice, gave her complete control over song selection, backing musicians, arrangements and production of the recording. Nina and her rhythm section recorded the entire album plus three additional tracks in just one session. In her biography of Nina, Nadine Cohodas recounts engineer Irv Greeenbaum's recollection of that day: "Nothing like Nina's artistry had ever happened before ... Her voice and the keyboard playing were so rich and interesting that they could have stood alone". Now with Analogue Production's 45 RPM release, the best-sounding version of this historic album gives listeners an even richer sonic experience. The dead-quiet double LP, with the music spread over four sides of vinyl, reduces distortion and high frequency loss as the wider-spaced grooves let your stereo cartridge track more accurately.